Gorgeous 14k Yellow or White gold classic cross pendant. Cross measures 30.5mm in length before the bail by 21mm across. A great design, made in the United States. 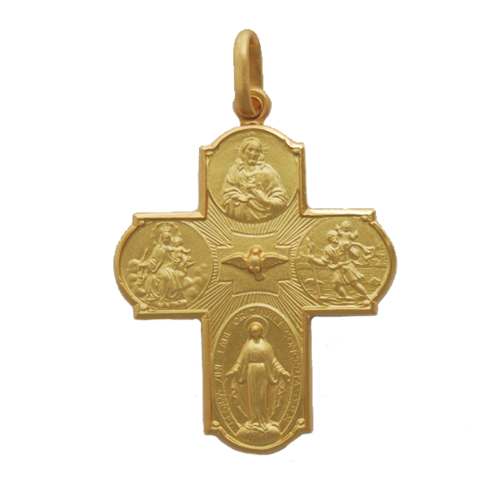 Incredible 18k Yellow Gold Processionale cross pendant. This Italian created cross measures 36mm in length by 20mm across. Cross weighs 7.2grams. Buttery 18k Gold, what an amazing symbol of your faith and devotion. Stylish Bold 14k Two Tone gold Latin style cross pendant. Cross measures 41mm in length by 20mm across. 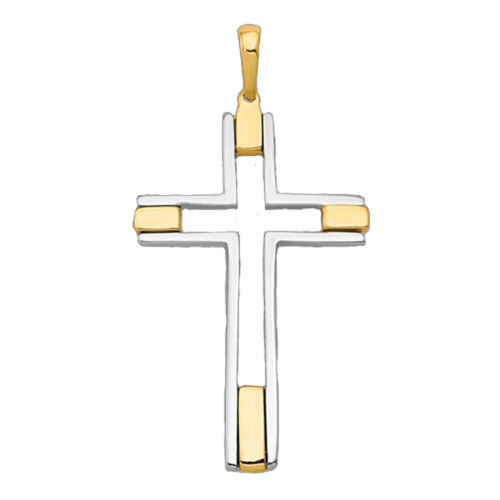 Cross is created in the United States and weighs 5.17grams. Cross is casted and has an open back. Luxurious 18k Yellow Gold Scapolare cross pendant. This Italian created cross measures 30mm in length by 23mm across. Cross weighs 6.10grams. This four-way cross features The Sacred Heart, Joseph, Christopher, and the Miraculous Medal at the bottom with a center Dove. 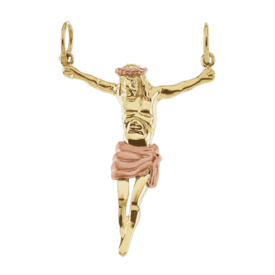 Beautiful buttery 18k Gold, what an amazing symbol of your faith and devotion. 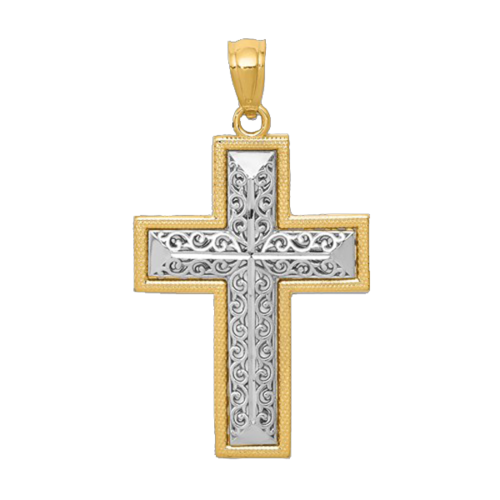 Beautiful 14k Two Tone Gold Filigree cross pendant. Filigree cross measures 30.6mm in length by 17.4mm across. Cross design is reversible and features a polished finish. White gold is Rhodium plated. This cross is made in the United States and weighs 1.62grams. Incredible 18k Yellow Gold Processionale cross pendant. This Italian created cross measures 32mm in length by 17mm across. Cross weighs 4.2grams. 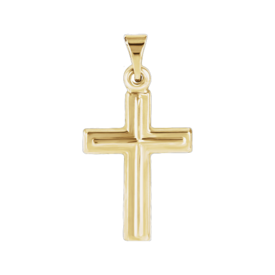 Buttery 18k Gold, what an amazing symbol of your faith and devotion. Cute Two Tone gold cross. 14k Two Tone gold cross features a textured white center with a diamond cut cross accented with 14k yellow gold ends and bail. 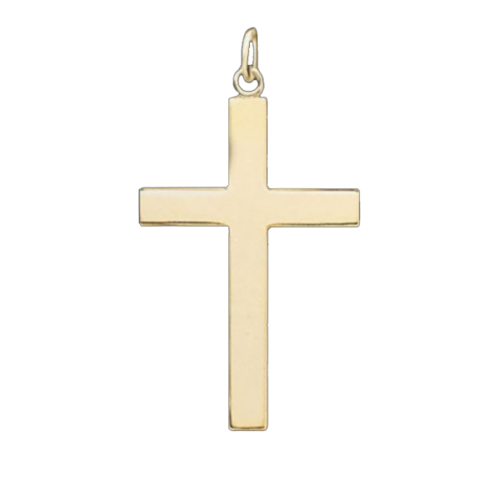 Cross is made in the United States and weighs 1.19grams. 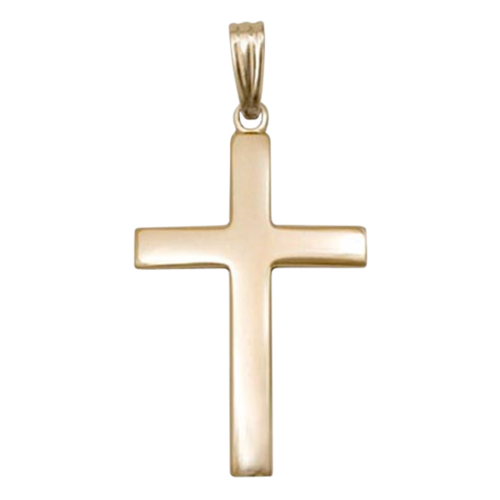 Adorable 14k Two Tone bordered cross pendant. Cross measures 1 inch before the bail with a polished and diamond cut finish. 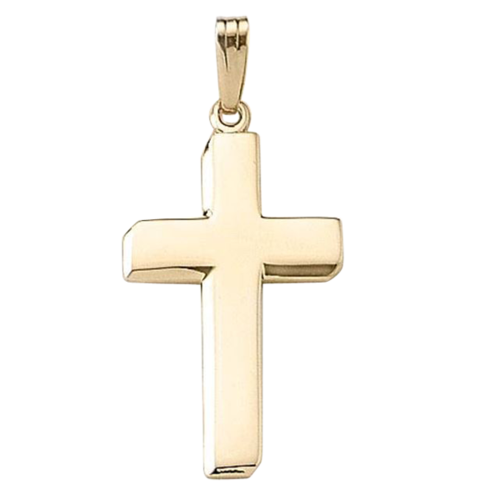 14k Two Tone Modern design cross pendant. This cross is 50mm (2 inches) in length by 25mm across. Features a satin and polished finish. Cross weighs about 3.22grams and is made here in the United States. Cross is solid. Two Tone "Jesus" pendant. 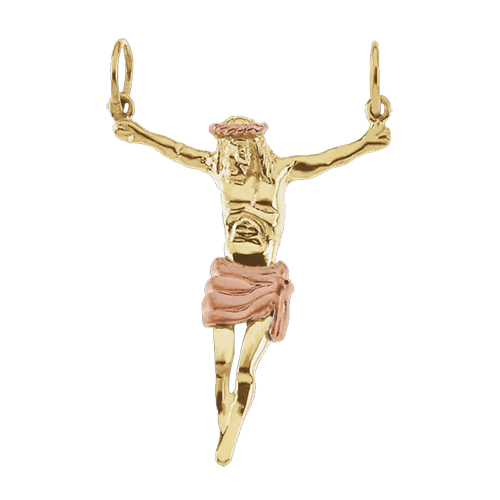 14k Two Tone Gold "Jesus" on the Cross pendant. This symbolic style is available in 4 sizes from a small 29mm in length to a very large 60mm selection. 14k Rose Gold crown and cloth give this pendant extra style. Gorgeous crucifix pendant. 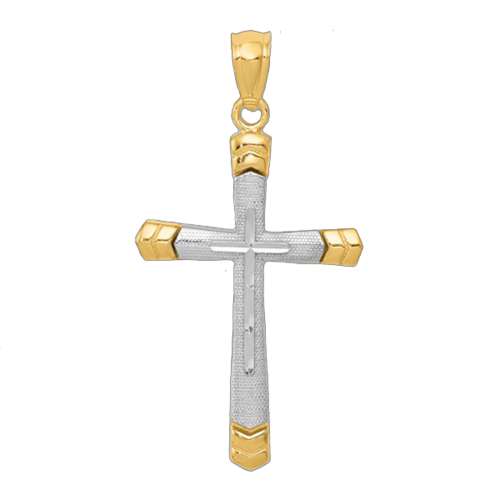 Italian Two Tone Cross pendant. 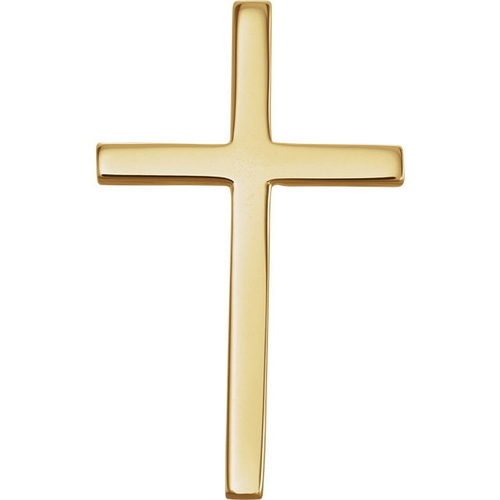 Stylish 14k Two-Tone gold polished cross pendant. Cross measures 33mm in length by 17.8mm across and weighs 2.19grams. 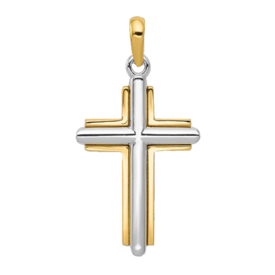 This Italian crafted cross is part of our "Guaranteed for Life" collection. A solid, polished cross pendant. 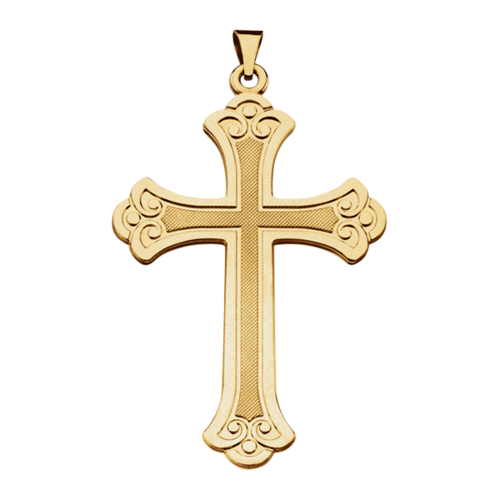 Stylish 14k gold cross pendant. Cross is solid polished design you're going to just love. Measures 34mm in length by 17mm across. Classic style perfect for anytime wear. 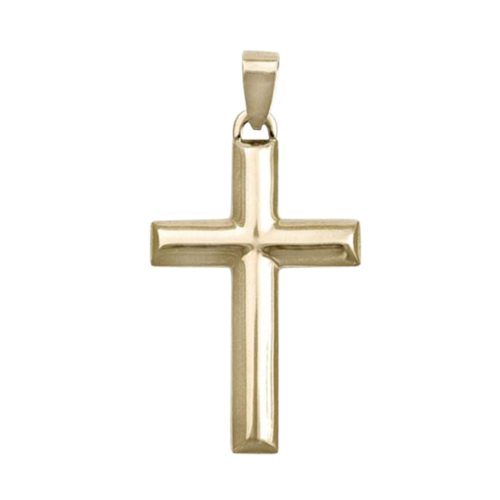 Polished Solid cross pendant. Classic design cross measures 32mm in length by 15mm wide. A great cross for anywhere, anytime wear. Prefer 14k White gold? Order this design in 14k Yellow or White gold. 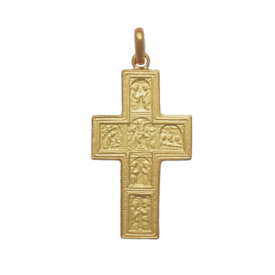 14K Gold Eastern Orthodox Design Cross. This cross is available in 3 sizes. Medium 26mm x 18mm (25mm = 1 inch), large is 33mm x 22mm, and Jumbo size is 46mmmm x 31mm almost 2 inches in length. 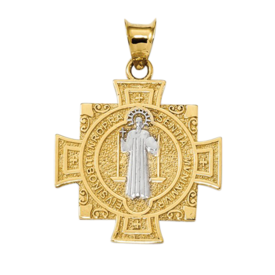 This is one of our most popular cross pendants, a great design. For your convenience we have added a chain selection, will match your gold selection, of course we have many additional chains to choose from in our chain category. 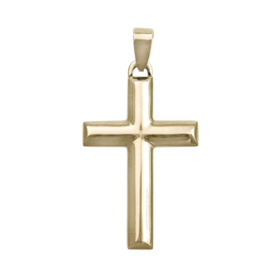 Men's Polished cross pendant. Large hollow cross pendant measures 40mm in length by 21mm wide. 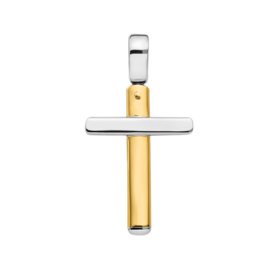 Cross features a plain polished finish. Order this design in 14k Yellow or White gold. Beautiful Polished 14k Gold Cross pendant. 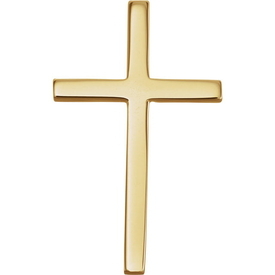 Order this solid Gold cross in 14k Yellow or White gold. Lovely symbol of your faith. Cross measures 40mm in length before the bail by 27mm across. Great solid cross for everyday wear. 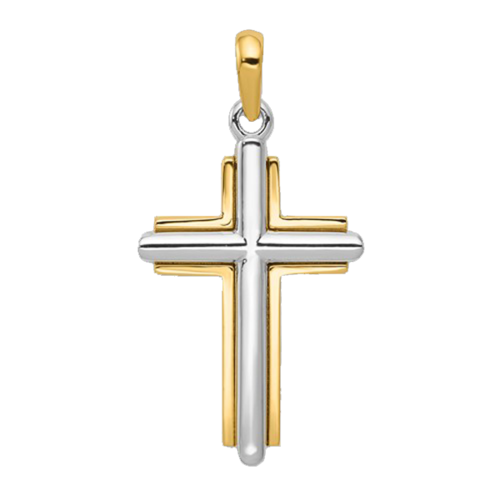 14k Gold Cross or Platinum cross pendant. This simple style looks great in either metal. Measures 17mm in length by 12mm across. This cross is small but somewhat chunky, nice everyday design. 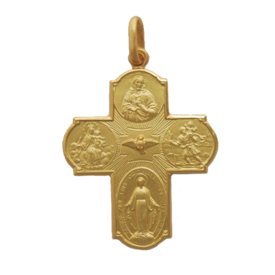 Beautiful 14k Gold Four-Way Cross pendant. This measures 29mm in length by 23.5mm across and weighs 3.51grams. Cross features the Holy Spirit at it's center with Jesus, Miraculous, St. Christopher, St. Joseph. Symbolic design you'll cherish for a lifetime. 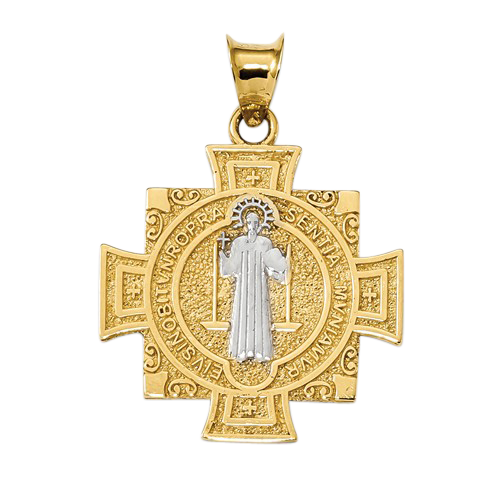 14k Gold St. Benedict pendant. Pendant measures 19mm by 19mm. 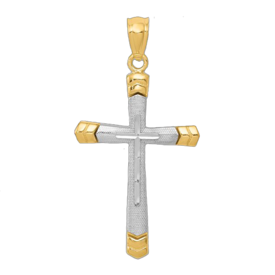 White gold portion of this cross is Rhodium plated. 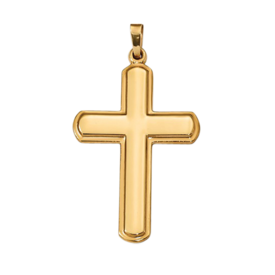 Stylish 14k Gold simple cross pendant. 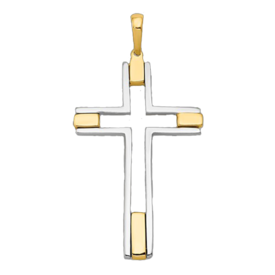 Cross available in 14k Yellow, White, or Rose gold selections and 3 different sizes. Our price shown is for the smaller 21.7mm (about 3/4 of an inch) by 13.5mm across. This cross design has a hidden bail.